Entertaining Elliot: Halloween Party Essentials and Giveaway! 1. Chewits Chewmix and Vampire Fangs* - You can't have a Halloween party without sweets and these spooky Chewits are perfect for little ghouls with a sweet tooth! 3. Halloween Costumes by Tu @ Sainsburys - When I was a kid, our costumes were made using black binliners and a cheap witches hat but these days, children are spoilt for choice with ready made costumes! Sainsburys have the best outfits for a range of ages and we always buy Elliot's costume here. They are great value, especially when the 25% offer is on! 5. Giant Spider - Poundland £1 - I've got a bit of an obsession with Poundland, I love it! I went in to check out their Halloween section last week and I was absolutely blown away by their range. They have literally everything you could need to throw a Halloween party, and all for a pound obviously! I stocked up for Elliot's forthcoming spooky birthday party but I'm going to pop back this week and pick up a couple of these giant spiders, you can't go wrong for the price! 6. Zippo Candy Apple Red Candle Lighter* £13.75 - I don't like using matches around Elliot and keep them on a high shelf but this candle lighter is a great alternative for lighting your pumpkins. Love the colour of this and also love that is has a child-resistant safety button! 7. Kids Halloween Party Music £5.99 - To really set the scene at your party you need one of these spooky CDs! Featuring songs such as Ghostbusters, Monster Mash and I Put a Spell on You this is bound to get your little monsters dancing. 8. Tobar Clockwork Zombies* - For a fun alternative to sweets, Tobar has a great selection of Halloween toys featuring items like the clockwork zombies, jumping spiders, bouncing eyeballs and my personal favourite...Spew Balls! Tobar have given me a bundle of these to give away so see below for details on how to win! 9. Huggies Style on The Go Wipes* - You're going to need something to clean the sticky fingers and faces of your Halloweenies after all the treats so this is a must for any party! I love Halloween and whilst Elliot is too young for trick or treating, we always get together with our friends for a little party for the kids. And in fact, this year Elliot has requested a spooky birthday party so I get to re-use all my Halloween decorations a month later to celebrate his 3rd birthday! We dress up and offer sweets when the local kids come calling. They always love our outfits! Yes we have a party! I have a little themed party for my two kids. 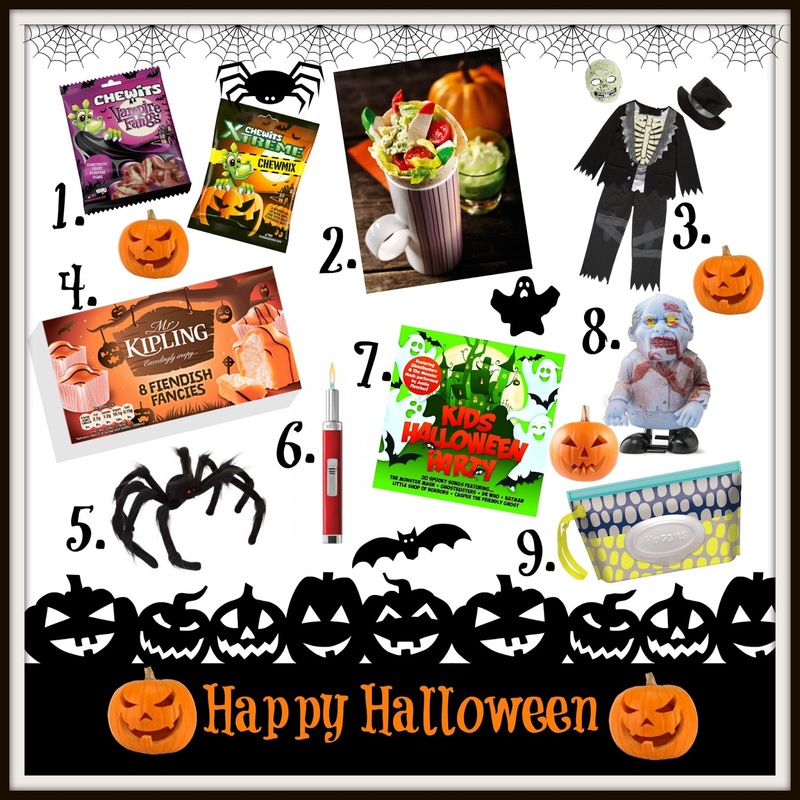 awesome Halloween essentials! I always celebrate Halloween, but different every year. some years, we've just stayed in and watched movies, but we might go out this year to an event! Yes we do, we dress up, bake Halloween treats and watch scary films! I use it as a chance to have a small Birthday Party for my youngest so he has some friends over and they dress up. This is probably the last year I will get away without a big party for him! Yes, we don't have any traditions yet - usually a kids' party & watch horror films. We usually go out to somewhere that has a Halloween theme. 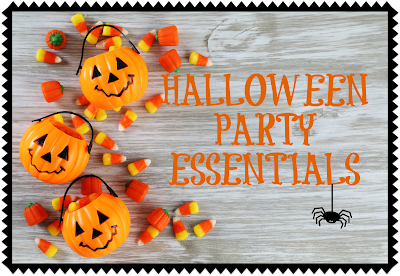 A little party, lots of themed food and scary films for the older ones. We get dressed up and decorate and make cookies. We carve pumpkins, put on costumes, and trick or treat. I love Halloween! 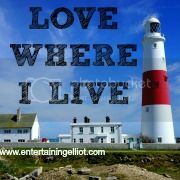 Yes we do! We dress up and go to partys and have bonfires etc!! I do - we normally go trick or treating. We go trick or treating - but only the houses decorated so we don't bother those not partaking. Then this year we're off to a Halloween party. And before school breaks up it'll be Halloween bingo! I make sure I have sweets for the little trick or treaters who come knocking at the door. Bless their little souls - they always look absolutely wonderful. We decorate the porch & dress up & go trick or treating. I like to take my daughter to a Halloween party and avoid the option of trick or treating if possible. Not that many people that we know give out candy anyway and I wouldn't take her to a stranger's house. This will be our first year celebrating as my son is finally old enough, we'll be dressing him up and taking him trick or treating to a friends house. Dressing up and eating Halloween goodies! We like having a little party home. My son is Autistic and gets too overwhelmed with trick or treating. Yes, with pumpkins, dressing up and trick or treating (and handing out tons of sweets to the hundreds of kids we get at the door!). We love to dress up, decorate the front window, and hand out goodies to little ghosts and witches.